DETROIT — At first glance, this year's edition of the North American International Auto Show might look like any other from the past: gleaming vehicles, bright lights and flashy displays trying to lure spectators to their offerings. But after traversing Cobo Center's massive exhibition space and ticking off the automakers, you'll notice what's not there: namely BMW, Mercedes, Porsche, Audi or Mazda. Those brands had been mainstays of the Motor City's celebration of the auto industry, which opens to the public on Saturday. But they are pulling out not just from Detroit but shows worldwide because of a bad date for their vehicle launch cycle, a declining bang for their buck, or bigger buzz from solo events or digital campaigns that go straight to consumers. In response, auto shows are retooling to remain relevant: moving their events on the calendar or amping up the customer experience by offering test tracks and collecting data on visitors. Detroit auto show Chairman Bill Golling is helming the city's last winter show before NAIAS prepares its move next year to the more weather-friendly month of June. Warmer temperatures will allow for test drives of new vehicles and autonomous and vehicle-to-vehicle technologies, as well as reduced time and costs for setup and teardown. "We can now give additional time and give that experience to the consumers," Golling said. "Not only test drives of the product itself but the technology will be available to test drive it, the autonomy, the connected cars. They can't get that over the internet." As companies have left, so have automotive reporters. The show had just under 4,600 journalists this year, but normally has more than 5,000, organizers said. As for public attendance, Detroit has drawn around 800,000 for the past several years. 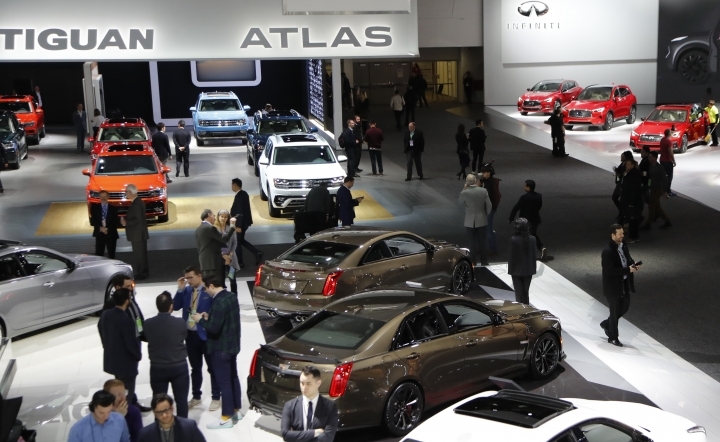 Representatives for the auto shows in New York, Los Angeles and Chicago say they don't release attendance figures. A spokesman for the New York show would only say that it has drawn more than a million attendees every year for the past 15 years, and Los Angeles says hundreds of thousands attend annually. 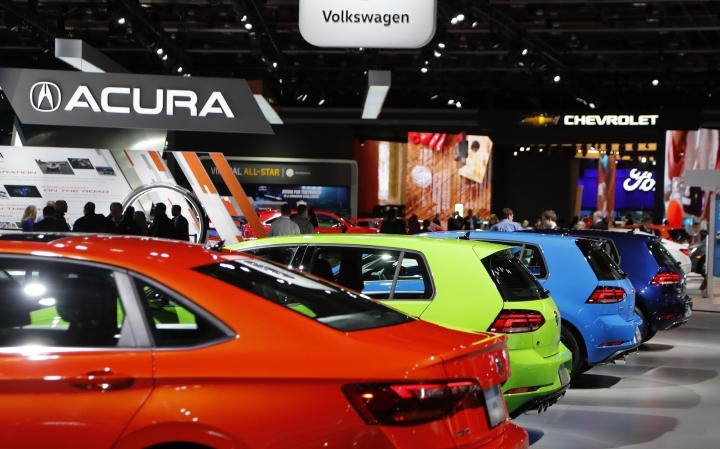 Chicago Auto Show General Manager Dave Sloan says attendance is "pretty consistent," but BMW and Mercedes-Benz have pulled out of next month's show. He's quick to add that others, such as Jaguar Land Rover, are increasing their show floor space. "We're concerned about it," he conceded. "We're doing everything we can to try and show them that performance." Those efforts include installing indoor test tracks and outdoor test drives, he said, because "butts in seats is a great way to show off your vehicles." Still, the overall trend continues for companies to explore other promotional paths, and "not just for auto shows but globally in all different industries," said Sam Abuelsamid, a senior analyst with Navigant Research. "Big companies are increasingly moving toward getting away from announcing new products, making major announcements ... where they're fighting for attention with 15-20 other companies and (instead) doing stand-alone events." Many automakers reject an all-or-nothing proposition. Detroit-based General Motors got good exposure for the 2016 Chevrolet Equinox small SUV outside of any auto show. GM President Mark Reuss said "it's hard to get the right exposure in the right medium" at an auto show, but he sees a balance. "I don't think it goes away," he said of the shows. "It's important that we're here and doing big things in Detroit." Luxury makes Volvo Cars and Jaguar Land Rover are skipping the Geneva auto show in March. Volvo said it's continuing to "move away from traditional auto industry events to focus on bespoke activities to introduce its new cars, technologies and services to media and consumers." Last year, Volvo unveiled the new model of its V60 wagon — not at an exhibition center, but in the driveway of a home in suburban Stockholm. Björn Annwall, Volvo's senior vice president of strategy, brand and retail, said last year that "automatic attendance at traditional industry events is no longer viable — we must tailor our communications based on how the options complement our messaging, timing and the nature of the technology we are presenting." "We are not saying never to car shows. We expect industry events like the Geneva Motor Show to continue evolving and we may return in future." Volkswagen officials say it was important to be in Detroit this year, even though its Audi and Porsche were not. "For us, it's a must," VW CEO Herbert Diess said. He acknowledged that "shows are declining" globally, but affirmed the automaker's decision to stick with the Motor City. "I just had a walk through the show — I had a good impression," he added. "There's a lot of new product being shown here, so why not?" Associated Press writers David McHugh in Frankfurt, Germany, and Mike Householder in Detroit contributed to this story.